SEZAD’s Tenders Committee awarded in its first meeting in 2015 one of the most prominent projects to develop Downtown Duqm consisting of an expansion on the main road. The contractor will commence works in the next few weeks, and the road is expected to be ready in the first quarter of next year. The project includes expanding the main road to be a dual-carriage way road with two lanes in each direction for 7 kilometers and 11 km length service roads in each side as well as the construction of 12 roundabouts on the service roads and construction of traffic light intersections on the main road. The project also includes the construction of car parking lots, landscaping, modern irrigation systems, lighting works and the diversion of electricity lines to underground cables. 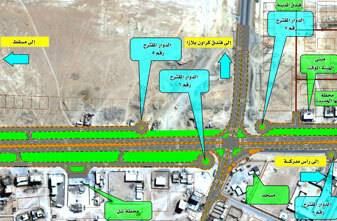 The main road will start at the entrance of Duqm Wilayat passing in front of the Office of H.E. Wali of Duqm and other government institutions, residential areas, commercial stores, and it will end with the road leading to Duqm Regional Airport. This project aims to improve the urban environment in Duqm that is consistent with the new urban development and to keep up with the projects that are being set up in the Special Economic Zone at Duqm. The project also aims to facilitate the traffic in Duqm and then towards commercial, industrial, and tourism zones. Urban development is a priority for SEZAD, and the Authority is working to make the area a model integrated economic city that combines between industrial, commercial, tourism and social projects, mixes modernity with authenticity, and provides all the needs of its citizens from different services. The new urban design of Duqm is an opportunity to prepare model cities for coming generations, and it can be considered as the first model of an integrated city in the Sultanate of Oman that gives great attention to urban planning and sustainable development and determines the needs of different sectors from land and the need of the population for services. Tens of projects are currently being set up in SEZD in different economic sectors, which falls within the Sultanate’s efforts to make SEZD one of the pillars of economic diversification and providing employment opportunities. Last year, SEZAD assigned many projects; and signed usufruct agreements with a number of local companies.